Dropbox vs. Box: What’s the Right Choice for a Small Business? In a head-to-head matchup, how do these two top cloud service competitors compare when it comes to serving the needs of small businesses? Keeping a company's most important files — including works in progress — where they are easily accessible from multiple devices by multiple users (i.e., in the cloud) helps small businesses run more efficiently. That's especially true given that 66 percent of small businesses rely on mobile devices to operate. Cloud storage also offers peace of mind. Crucial files stored off-premise and safely in the cloud aren't subject to computer crashes, fire, natural disasters and other hazards. Although using cloud technology is a no-brainer today, choosing a service is overwhelming for most small business owners. 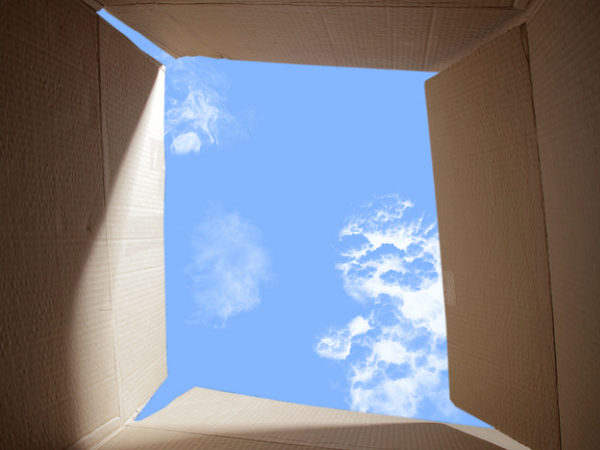 There are literally dozens of cloud service companies out there vying for your business. 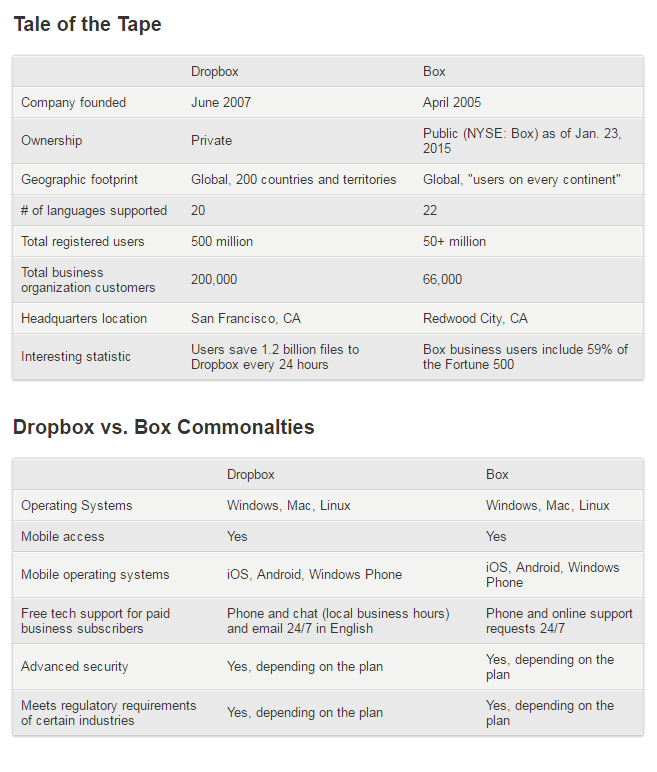 Here, we've compared two of the best-known companies — Dropbox and Box — in a head-to-head matchup. Although both companies offer an enterprise-grade plan, the plans and pricing here are those likely to be of greatest interest to small businesses. Dropbox’s Basic plan is free and offers 2GB of space, 30 days of file recovery, and integration with Microsoft Office 365 and other third parties. This plan is a good tryout option for individuals and small business owners. It can keep a modest number of files safe, accessible on virtually any device and shareable with others. From there, it’s easy to increase or decrease storage levels and users on Dropbox by selecting a paid subscription plan online. The next step up in Dropbox is Pro for Individuals, which, at $8.25 per month (when billed annually; month-to-month billing is $9.99 per month), provides an increase to 1TB of space, higher sharing limits and free priority email response from the Dropbox team. Dropbox Business starts at $12.50 per user per month (when billed annually; month-to-month billing is $15 per user per month) with a minimum of five users. Business offers enhanced collaboration tools, advanced security and control, and unlimited file recovery and storage space. Dropbox offers discounts for nonprofits, educational institutions and buying in volume. Box offers a free personal plan that provides 10GB of storage with a 250MB file upload limit. Upgrading or downgrading from one paid subscription to the next is easy and performed online. Box’s next step up is Personal Pro, a paid subscription plan at $10 per month for 100GB of storage and a 5GB file upload limit. Box’s built-for-business offering is Starter at $5 per user per month with a minimum of three users and a maximum of 10. Starter offers 100GB of secure storage with a 2MB file upload limit, with mobile access, desktop sync and standard business support, among other features. Box’s Business plan is priced at $15 per user per month, with a minimum of three users. It offers unlimited storage and a 5GB file upload limit, and includes single-sign-on integration, advanced user and security reporting, mobile security controls, and other goodies. Dropbox's range of plans is ideal for small businesses, including solo practitioners, because these plans provide the greatest flexibility and the ability to scale to demand.